Waterford County Museum: Ireland's Antarctic Explorers An Illustrated Talk. Ireland's Antarctic Explorers An Illustrated Talk. 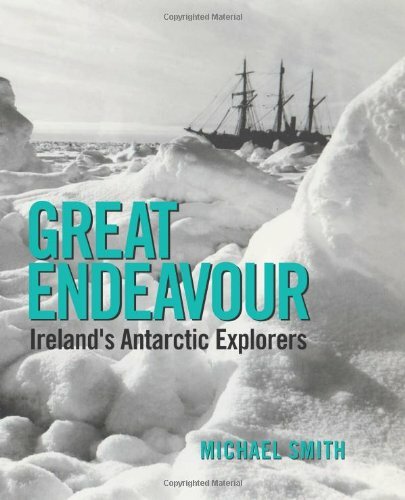 The Museum are delighted to have Michael Smith deliver a lecture on his latest publication "Great Endeavour Ireland's Antarctic Explorers". The book which covers 200 years of exploits in the frozen wastes, includes many previously untold stories and photographs of early explorers and discloses why so many Irish Heroes caught up in Ireland's fight for independence were soon forgotten. It also gives the first comprehensive account of hardy 21st century Irish adventurers who trekked in the footsteps of the pioneers. Mike Barry from Kerry,the first Irishman to walk over land to the South Pole, also Clare O'Leary the first Irish woman to march to the Pole to name but a few. Michael has written several books specialising on the history of Polar exploration. He is probably best known for his book Tom Crean "An Unsung Hero", which to date has sold 80,000 copies and has been published in the Irish language (children's edition). Michael is a regular visitor to schools and libraries and has frequently participated in the annual Children's Book Festival. This talk will be of particular interest to students and should not be missed. You can meet Michael later and buy a signed copy of his book, or it will be available to buy at the local Eason's book store. The talk will take place in Lawlor's Hotel, Dungarvan at 8.pm on Wednesday November 17th. Entry to the talk is €5.